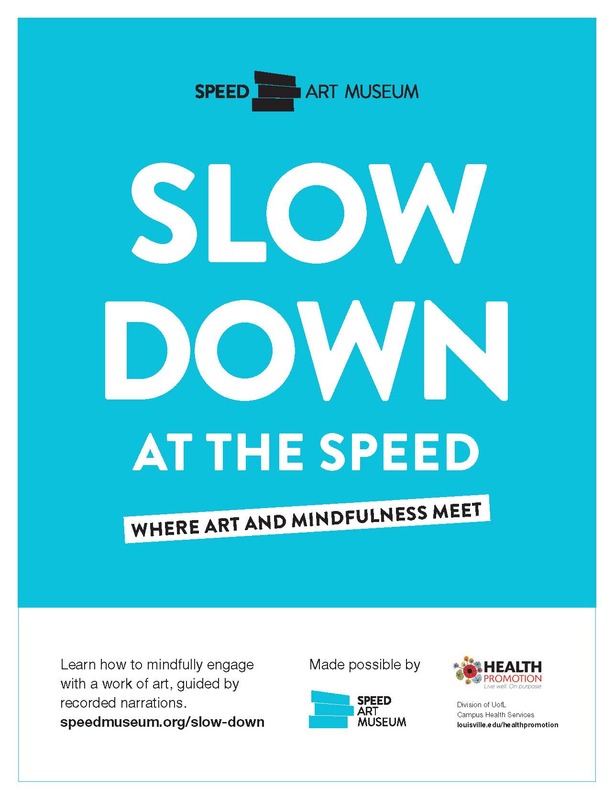 Health Promotion is partnering with the Speed Art Museum to bring you "Slow Down at the Speed". We encourage you to Slow Down at the Speed by spending an extended length of time with one work of art while listening to a guided mindful prompt that will encourage you to go deeper into the work of art. Enhance your present moment experiences with various mindful prompts that will be released at different times so you can engage with different works of art within the Speed. We have suggested a gallery for each prompt, but you are welcome to engage with any artwork that catches your eye. To get the most out of your experience slowing down at the Speed, please bring a pair of earphones with you for your listening pleasure. Click here for the collection of prompts. **UofL Students, Faculty, and Staff- remember you can visit the Speed Art Museum for FREE with your UofL ID anytime during their normal business hours. Thanks for slowing down at the Speed!